At last we have another contributor to the family Wiki! Today Julie Gould contributed to a page on Alfred William Green (1839-1886), which makes the family wiki what it is meant to be — a collaborative family project in which various family members contribute to build up our picture of the family. So today is a great day. I’ve edited the page a bit — renamed it to fit the naming pattern of other pages and added links, and that is of course what happens with a wiki — various people will contribute. As Julie has noted, Alfred William Green was the youngest surviving son of William John (Goodall) Green and Margaret Gray of Canada, who settled in Australia, and was a customs officer on the New South Wales Queensland border. We know very little about his descendants, so I hope Julie can help us there, particularly with the more recent generations. We know a little about Alfred’s eldest son, W.A.G. Esdaile Green, who changed his name to William d’Este-Stuart-Grey, and that another son Frederick Arthur Walpole Green died unmarried, but not much more. My grandmother was Janet McCartney Growdon, born Hannan (1882-1946). She died a couple of days before my 5th birthday, so I have only a few childhood memories of her, and of going to visit her and my grandfather at McKenzie Road in Durban, where they lived. In their back garden was a big avocado pear tree. Their house was near the Stamford Hill aerodrome, long since removed further north to Virginia, and replaced by sports stadiums – Kingsmead, Kings Park, and a new one being built for the 2010 Soccer World Cup. When we were in Durban a couple of months ago we visited my grandparents’ grave in Stellawood Cemetery, where they are buried with my uncle Willie Growdon, whom I never met — he was killed in a motorbike accident before I was born. Three years ago, however, we visited some other graves — of my grandmother’s grandmother, after whom she was named — Janet Hannan, born McCartney, and her husband Thomas Hannan. 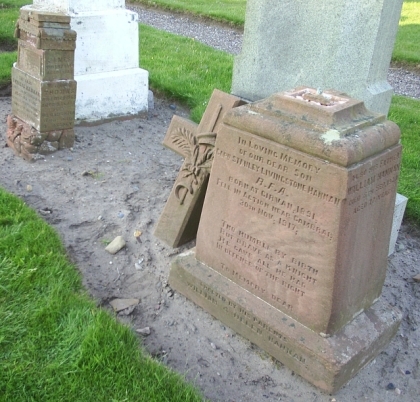 Their graves are in Girvan cemetery, in Ayrshire, on the west coast of Scotland. 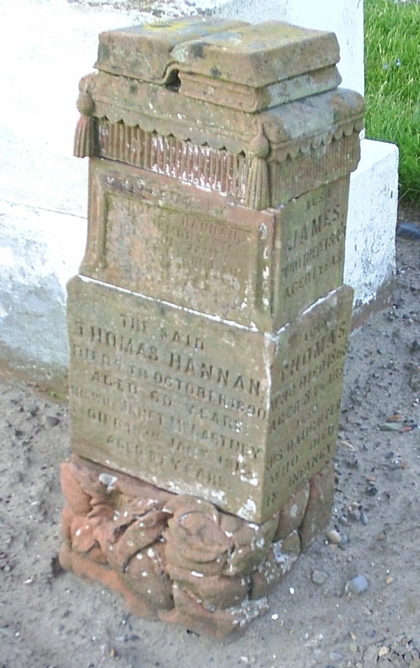 For much of the 19th century the Hannan family lived in Girvan. Janet McCartney came from Maybole, not far away, and they were married there. But most of their children died young, and their names are inscribed around the gravestone. The eldest son, William Hannan (1856-1928), went to Glasgow, where he met and married Ellen McFarlane. He was a carpenter and joiner. One of their sons, Stanley Livingstone Hannan, was killed in action in the First World War, and his memorial is next to that of his grandparents in Girvan Cemetery. William and Ellen Hannan’s eldest son Tom Hannan (1879-1941) married Hannah Carson and lived in Glasgow. He was a life-long socialist, and was jailed as a conscientious objector in the First World War. His youngest sister Maria (Ria) married Jack Cochrane, and we know nothing about what happened to them. If anyone knows, please let us know! The other children of William and Ellen Hannan came to southern Africa. Janet McCartney Hannan met George Growdon in Waterval Boven, Transvaal, where he worked as an engine driver for Central South African Railways, and they were married there on 2 June 1909. My mother Ella Growdon was born in Pretoria exactly a year later, and a couple of years after that they moved to Durban permanently. Emily Livingstone Hannan married first Charlie Mould, and then Arthur Sharp, and lived in Berea in Johannesburg. David McFarlane Hannan went to Northern Rhodesia (now Zambia), and died at Ndola in 1951. Their children lived in Zambia and Zimbabwe. Duncan MacFarlane Hannan (1894-1957) married Margaret Helen Bain, and was a butcher in Durban. If anyone reading this is related to this Hannan family, please visit our family Wikispace, and have a look at the Hannan family pages there. You can goin Wikispaces and add to the family stories there.